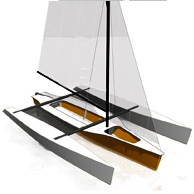 The TRICKY FIVE has been conceived for a precise scope: to realize a boat, which in relation to its size would maximize the ratio between speed and cost. This means that for a determined cost for materials and hours of construction required, it would be the fastest possible. Due to the lack of a specific index that would allow us to determine if this scope had been achieved, I had to create one myself (the Lod number, which measures the degree of economic efficiency of a boat – see box). The Nlod for TRICKY FIVE is 0.22 and we believe that it is difficult to reach a better result. This has been achieved thanks to hulls that are at the same time easy to build and efficient from the hydrodynamic point of view. The chine hull has a wetted surface slightly higher to that of a round-bilged hull and the length/width ratio is 10.3, which is very high for a trimaran of this size. The boat is not too wide, which makes it easier to manoeuvre and light. The sail area is quite large, but rather than a Marconi rigging, we have chosen a gaff rig (to be more exact, a way between the gaff rig and the gunter). This helps to keep the centre of sails low and, above all, is much more economical to build, as the spars may be built in aluminium or wood. As the main sail does not have roach, this eliminates the need for battens. For those who prefer more conventional solutions, we also afford the version with Marconi rigging, which is more expensive but undoubtedly more performing upwind. The beams are simply aluminium tubes fixed to the amas and to the main hull. Assembling is done by inserting the tube of the amas into those of the main hull. This operation takes only a few minutes. Also for the centreboard, we have chosen the simplest of solutions from the construction and manoeuvre point of view, i.e. fixed low aspect ratio centreboards mounted under the amas. It is not the ideal solution for sailing upwind and obviously, we cannot expect this boat to beat against the wind as an American Cup boat would do, but this limit is compensated by absolute speed. While sailing, the boat reaches its best and it is extremely fast and enjoyable. The construction of the TRICKY FIVE is stitch and glue and is very simple. The finishing of internal edges, the most tiresome and lengthy task of this construction technique, is reduced to the minimum, as the internal edges are hidden in the hulls or under the double bottom of the central hull. Outside, all the edges are covered with a single layer of fibreglass – which makes the hull rigid, solid and resistant to abrasion.